We currently have several beautiful spring heifer and bull calves available. These calves are the product of our line-breeding program discussed on the Devon page. They will be ready for pick up in the fall. They will have been haltered and handled regularly. From time-to-time we have yearling and mature, bred cows available. These cows are being sold to make room in our herd for the heifers we are adding to our herd. We require a $200 per animal deposit with your order. Orders are filled in the same sequence as they are received. Please contact us for more information. If you are interested in purchasing OGF ewe lambs, we suggest that you contact us as early as possible as we generally have orders for our ewe lambs, with deposits, before the lambs are born in February/March. We almost always have a very nice selection of white and colored ram lambs available. We also offer an excellent selection of our mature flock rams in order to give our customers a choice of selecting either an adult or a lamb ram for their breeding program. Wethers can be available for $300 to people who want to raise Leicester Longwools for their exceptional fleeces but are not interested in breeding. Orders for wethers, with deposits, must be placed by February. We require a $100 per sheep deposit with your order. Orders are filled in the same sequence as they are received. OGF white and colored fleeces are exceptionally clean and generally a 5 to 6 inch staple, as we shear twice a year. Longer staple (10 to 12 inches) can be ordered. Price ranges from $8 to $12 per pound. We supply several rug weavers. Contact us for pricing on large orders. Satisfaction is guaranteed. White Leicester roving is $1.50 and colored Leicester roving is $1.75 per oz. We work hard to ensure that we produce the very best representatives of the breed and take great pride when our customers express their satisfiaction. “In looking for a family cow I began reading the description of the American Milking Devon I realized this breed had all the traits I was looking for in a family cow. I found Richard through the American Milking Devon Association. He was very quick to respond and I knew immediately that he was very knowledgeable about this breed of cattle. I explained what I was looking for and he felt his heifer met all my criteria. "The fleeces are excellent! I’m so very pleased. The natural (colored) is stunning – great color and luster. The white is also fabulous – so very clean and no trace of off-white to yellow hint. What a time saver to not have to wash and card. Thank you!" " The fleeces have arrived. And of course, they are gorgeous. Sometimes I think how nice it would be to have sheep -- why with fleece like these!! Your hard work certainly shows!! Keep me posted on the shearing season; I am sure I will need more. Thanks so much"
"The beautiful white Leicester Longwool fleece arrived yesterday. Thank-you for raising this heritage breed and providing hand spinners with healthy clean fleeces." "I first met Donna and Richard at the Maryland Sheep and Wool Festival in 2003. I was looking for a reliable source of high-quality fleece and was willing to consider any breed with fleece suitable for rug weaving. After scouting the entire show and talking with many breeders, I kept returning to the Larsons and their beautiful sheep." "Since then, all of the fleece for my hand-woven rugs has come from Old Gjerpen Farm. The fleece is wonderfully clean. The natural colors are beautiful and the white and lighter colors take natural dyes beautifully." "Richard and Donna are the best!" For more specific recommendations or questions, you may e-mail Susan at susan_edmunds7@msn.com. Striped Rug #1 (4’ x 6’, 2005). This rug is woven with three natural colors of OGF Karakul wool (grey, silver, and red) as well as dyed white. Striped rug # 2 (46” x 74”, 2006). This rug shows the naturally black Karakul. The lighter areas are white Karakul yarn that were painted before being woven. Striped Rug # 3 (45 ½” x 70 ½”, 2005). In this rug, weft rows of naturally black Karakul alternate with all the other natural colors dyed with madder root. In some places the madder dye is more intense; in other places it is combined with Osage-orange dye. The rug is tapestry woven. 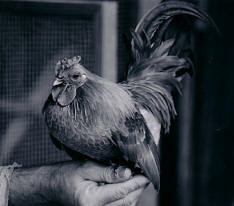 OGF has a flock of very rare Nankin Bantams. Original stock from Colonial Williamsburg. 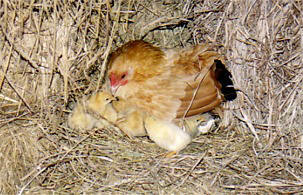 Nankin hens will raise three to four broods of chicks each year.